Golden wheat swaying in the breeze, fields of potatoes and berries, goats and alpacas, bison, lavender and bikes. In no particular order: these are snapshots of what we experienced for a few days in Oregon's Washington County---the area tucked immediately west of Portland, Oregon. The Washington County Tour Board* was kind enough to invite my farm-loving blog and food-loving family (see above) to tour their county for a few days. My husband angled for scenes-by-bike while I ogled the map for local farms. We never regret a couple day adventure: it is always brimming with new friends, memorable food and unanticipated discoveries. Our hub was McMenamins Grand Lodge in Forest Grove. Whose remarkable idea was it to create lodging full of pubs, shared bathrooms (picture folks walking around comfortably in robes), a touch of recreation (in this case: Frisbee golf, outdoor movies, rotating bands) and with historical interest (quotes on the wall re: folks who had lived and visited this lodge from orphans to residents to famous folk)? Kudos to them - my teen sons played a few rounds of Frisbee golf, we hustled one another over beer and late-night cards, and enjoyed a solid soak in the soaking pool. 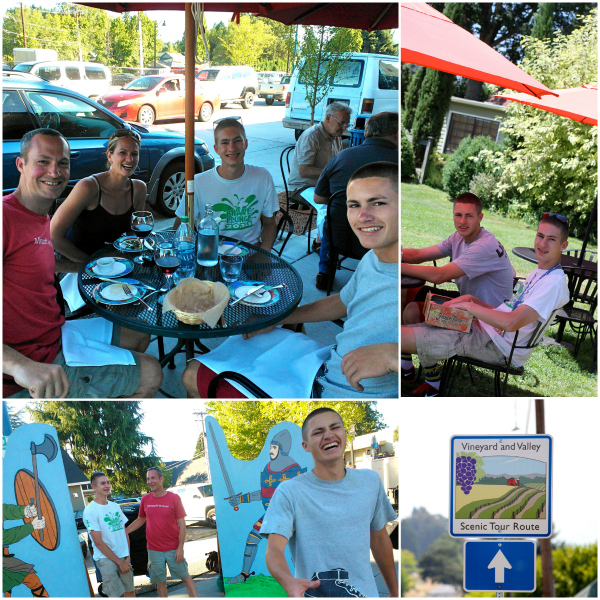 Also in Forest Grove: we enjoyed a memorable evening meal at farm-food sourced 1910 Main. We are picky eaters (this happens when mom is a sustainable-food-seeking-almost snobby-chef AND when you live and eat in Italy for a year). We would absolutely eat there again. Three mornings in a row we went straight to Maggie's Buns for breakfast. We loved Maggie (see pic of Maggie sandwiched between my giant sons) and you will too: go eat her famous head-size cinnamon buns (which she once sent to a customer in CA, the overnight fee a mere $90), delish omelettes, breakfast burritos and Stumptown coffee. 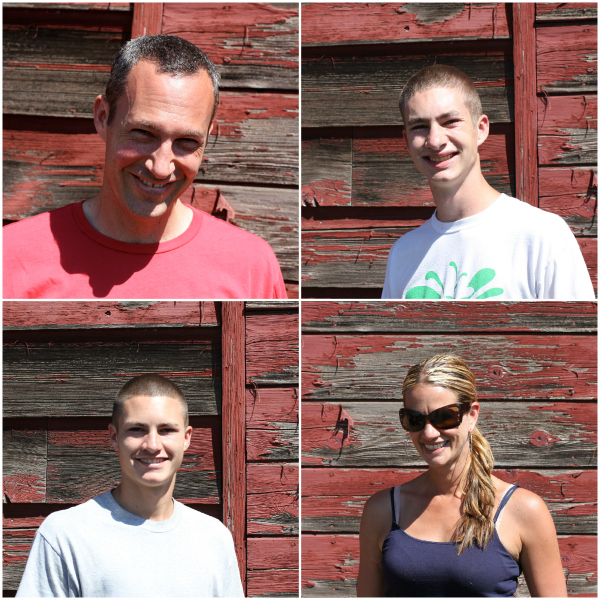 We made new friends and had hand-crafted goat cheese at Quail Run Creamery (Gaston, OR). A lunch at Cruise in Country Diner morphed into a shake-our-heads Portlandia moment: the fries were from potatoes down the street, the cheese from Quail Run Creamery, burgers and bacon from nearby ranchers and Oregon's own Dave's Killer Buns. L-BAR-T Bison Ranch - adored the bison jerky and pepperoni sticks. 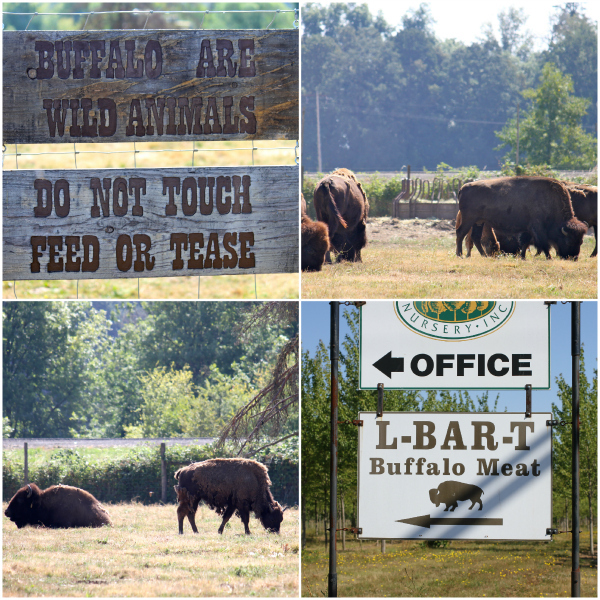 Will definitely be buying bison meat from Tom & Lori in the future. Mountainside Lavender Farm - met Lori and sipped lavender lemonade: we highly recommend a visit (u-pick and tiny store; I bought lavender BBQ sauce and lavender honey). South Store Cafe - a worthy lunch, and just across the street from Smith Berry Barn. An authentic, local hang-out. Smith Berry Barn - we chatted with first generation farmer Rich Hildner (pictured below); the berry barn store is a must see & we loved the u-pick! They have a plethora of berries, which means whatever time of summer you swing through: something will be ripe for the picking (Loganberries, marionberries, blueberries, currants and more). a random garage sale - we are gluttons for garage sales, barn sales and the like - we bought nails and one garden tool. Baggenstos Farm - great tour of potato farm and working farm store (photo below), includes pumpkin and berry u-picks and a yearly state-of-the-art corn maze. Learned all about crop rotation from multi-generational farmers. In Sherwood, Oregon: we happened upon Da Mimmo where we soaked up Italian food and wine, then meandered through the town's Robin Hood Festival (lucky timing!). Saturday to Sunday or our adventure included biking the Banks-Vernonia Trail. We cycled from Banks to Vernonia, stayed at Coastal Mountain Sport Haus, then cycled back to Banks. I great rails to trails ride through the woods, just over 20 miles each direction, this was a perfect weekend ride. *though sponsored by Oregon's Washington County, my opinions, photos, experiences are all my own.